eReminders and eConfirmations help you manage and automate your appointment reminder and confirmation process. Only locations on support with a unique registration key can use eServices. This free eService sends automated Integrated Text* message and/or email reminders about upcoming appointments. eReminders are intended to be sent a short time before an appointment so patients don't forget to come. Open Dental will automatically send the eReminder when it is due and generate a commlog. *Text reminders require the Integrated Texting eService. Email reminders can be sent at no additional cost. Send automated text message and/or email reminders about upcoming appointments AND allow the patient to e-confirm. Open Dental will automatically send the eConfirmation when it is due, change the appointment's confirmation status (optional), and generate a commlog. 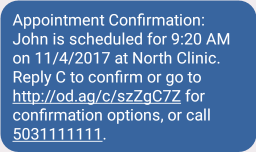 Patient has an option to confirm the appointment via text message or URL link. When confirmed, the appointment's confirmation status automatically updates. *There is an additional per month, per location fee for eConfirmations. Monthly fee includes Integrated Texting access. See Fees for Software, Support, Service.